6 Must-Try Desserts for the Holidays! It’s that time of year again! Time for the holidays! Thanksgiving is right around the corner and before we know it Christmas will be here! My family usually stays pretty close to home for both holidays, but this year we are traveling down to South Carolina to spend Thanksgiving with Kenny’s side of the family! We are really looking forward to it because it’s been too long since we’ve spent the holidays down South, AND because Kenny’s mom, my mother-in-law, is turning 80! 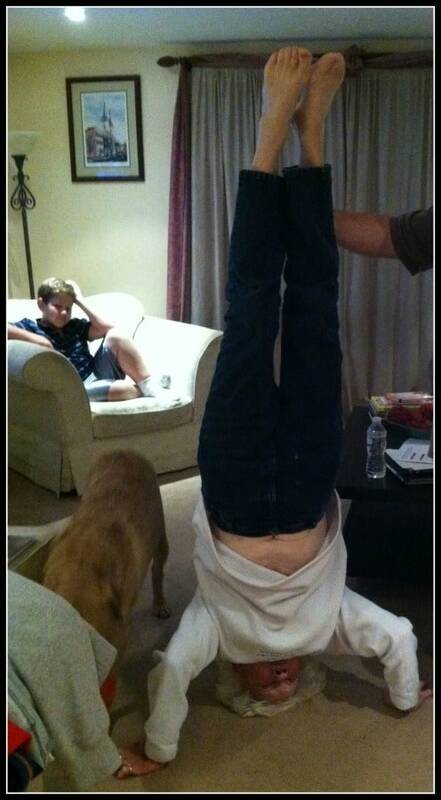 You’d never know it though – this woman is amazing and literally can still do headstands! As most of us know, with the holidays comes delicious comfort food. And what’s better than looking forward to heavenly, homemade dessert! This is the perfect time to share 6 must-try desserts that I have been drooling over think look ta-die-for for the holidays! I found these recipes from the cream of the crop – bloggers of course! I chose recipes that look delicious, and that are a little more unique than the traditional fare. And, I didn’t want one holiday to feel left out, so I picked 3 recipes that would be great for Thanksgiving and 3 recipes that would be great for Christmas (of course, make them whenever you want to). First up! 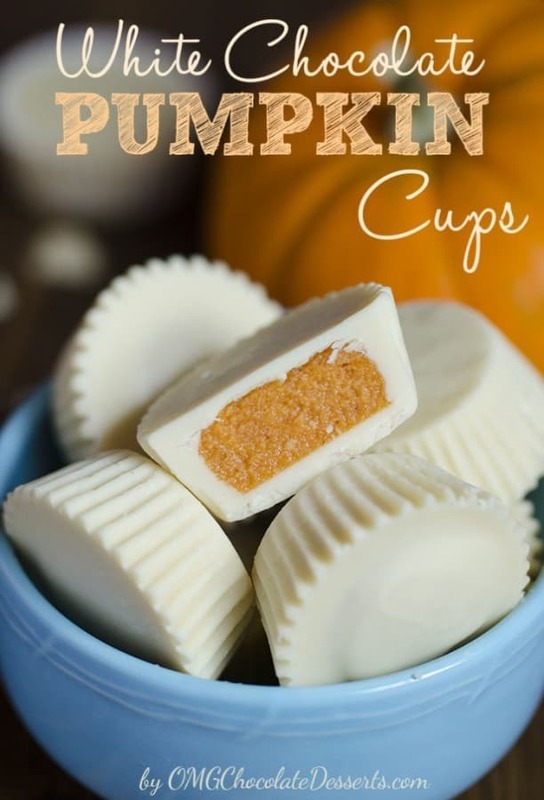 White Chocolate Pumpkin Cups that I found on a delectable blog called Oh My God Chocolate Desserts! OMG, do these look AMAZING or what? Not only do these look delicious, but if you bring these to a family function, Thanksgiving or a get-together with friends, I promise you that you will be the superstar! Vera, the creator/writer of Oh My God Chocolate Desserts just so happened to come up with this recipe herself! You cannot get any more unique than that! The 2nd of the 3 dessert recipes that I think would be incredible for Thanksgiving is Butternut Squash, Apple & Pear Crisp that I discovered on a blog called Edible Perspective! The beauty of this scrumptious dessert is that it is made with all healthy ingredients AND is even gluten-free and vegan! Put it this way, this blog has such great looking and healthy concoctions that I’ve clicked on the “get notifications” option on her Facebook page so I never miss a single recipe! 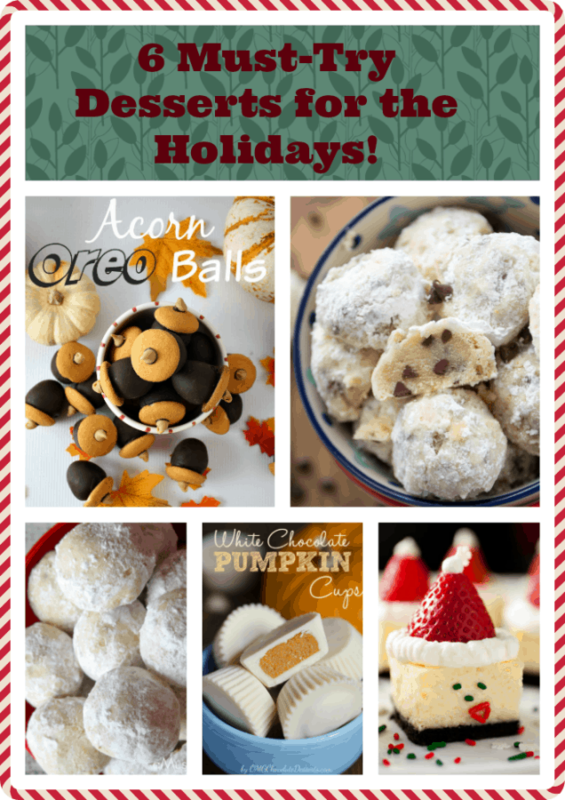 The last Thanksgiving dessert recipe I’ve chosen to share is such a fun, yummy looking recipe called Acorn Oreo Cookie Balls from our friends over at Home Made Interest! How freakin’ adorable are these? If you have kids at your Thanksgiving dinner, and even if you don’t, these cookie balls are guaranteed to be a hit! According to the girls at Home Made Interest, this recipe is quite easy too! Score! 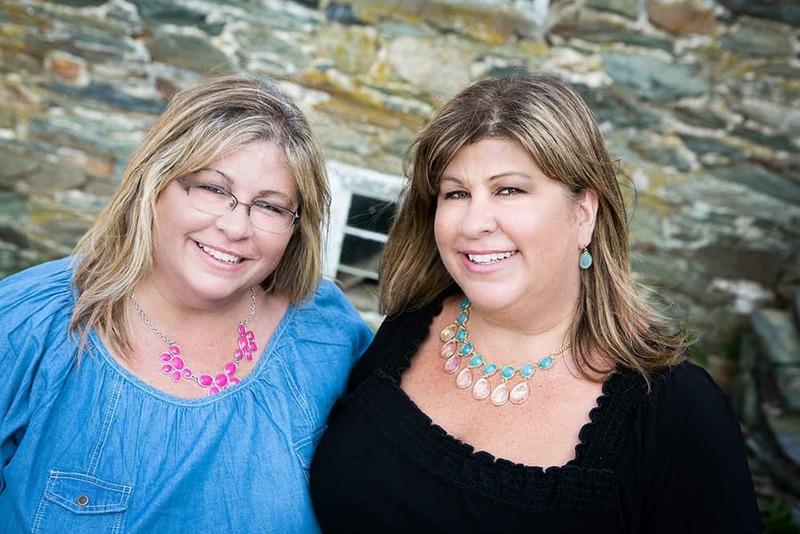 Go check out this recipe, and while you’re at it, check out their blog – these girls are SO much fun – in person and on their blog! 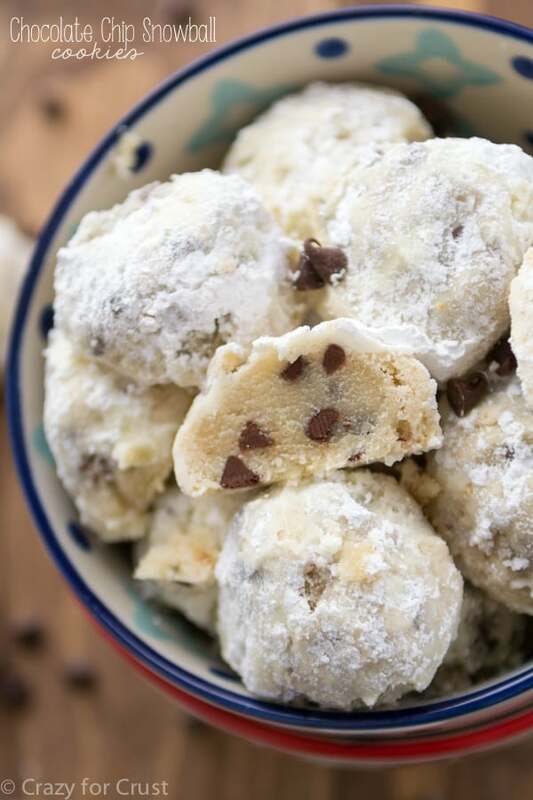 Let’s start with Chocolate Chip Snowball Cookies from Crazy for Crust! You know the traditional Russian Tea Cake Cookies that are abundant during the holidays (which I LOVE, by the way)? Well these are them…with a twist! Enter….chocolate chips! GENIUS! This girl is smart, and I think I’m pretty darn smart too to choose her recipe to share. I mean, come on, the blog’s name is Crazy for Crust – I don’t think you could go wrong when looking for a great dessert recipe on this site! 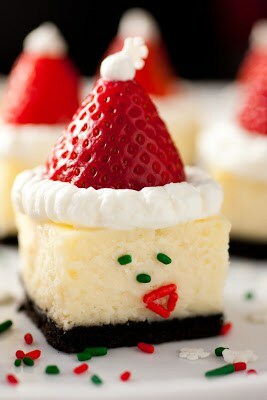 Next, I give you Santa Hat Cheesecake Bites from Cooking Classy! These immediately caught my eye when I was looking for unique, festive desserts! In my humble opinion, you cannot go wrong with cheesecake! You gotta love her little special touch of using sprinkles for Santa’s face too :). Adorbs and delicious too? Yes, please! Last, but certainly not least, I’d like to share a recipe from one of our respected blogger friends, (a)Musing Foodie! I know I’ve already shared a “snowball” cookie recipe, but I just couldn’t resist sharing this one as well. And, if the Farmer’s Almanac proves to be true this year, we all should probably get used to snowballs anyway! 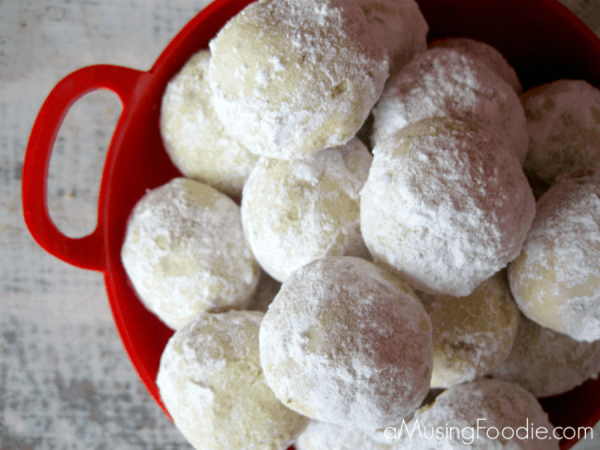 Take a look at these Almond Lime Snowball Cookies! The flavor of almond is one of my faves, and the unique addition of lime? Yummmmay! Please also check out her site – you will thank me! She is a class act and an amazing cook! I hope you’ve enjoyed my 6 must-try dessert recommendations for the holidays! I wish all of you a wonderful, happy, family and friend-filled, delicious holiday season! 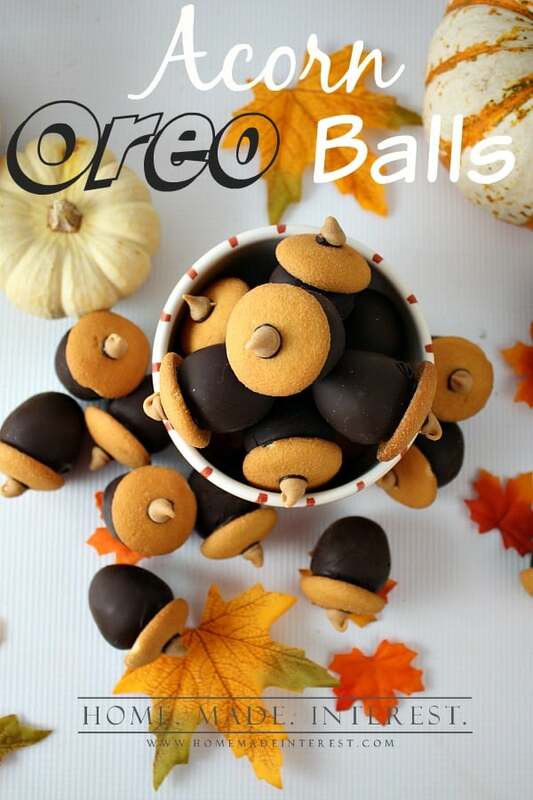 Thanks for featuring our Acorn Oreo Cookie Balls! Thank YOU for your contribution! You girls at Home Made Interest rock! Thank you for your contribution to our post! Love your site!